The end of January is upon us, and so the end of our Thai adventure. It’s been a busy week, there just don’t seem to be enough hours in the day at the moment. So I’ve ended up condensing the final week into one post. It’s been great fun, and while I do feel like I’ve learned a lot, it’s just the tip of the iceberg (so to speak). Steve had been keen to try making Thai Samosa, and today he got the chance. 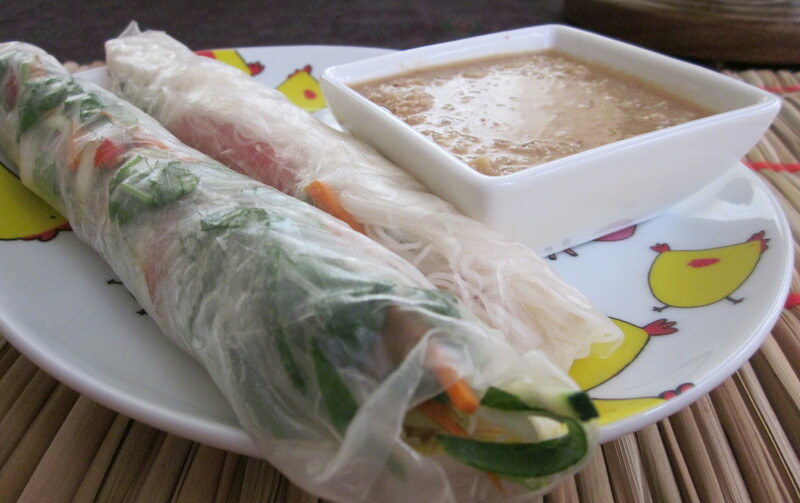 The wrapping is rice paper rolls, and while they didn’t look that pretty, they tasted really good! I decided to make a batch of Rice Paper Rolls, another of my favourites (yes, I know it’s a long list), partly because I just wanted to eat some, and partly so I could take some to work for lunch. There was a peanut dipping sauce to accompany that is really quick and easy to whip up, and also makes a great salad dressing. 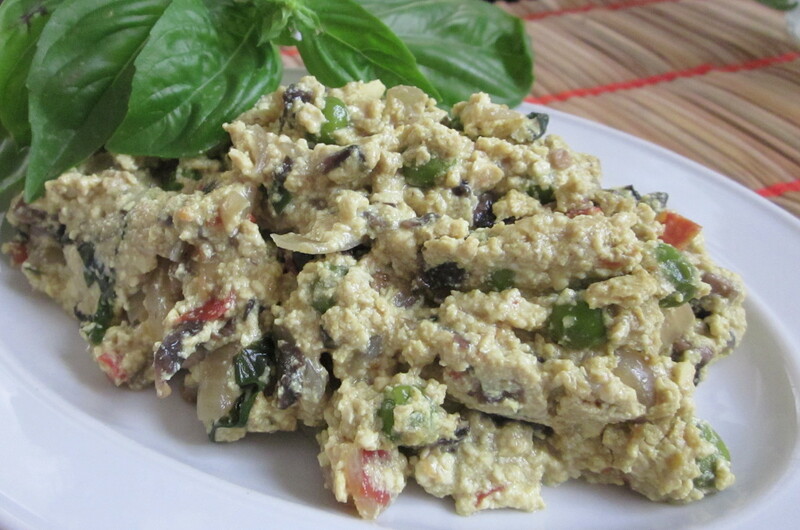 I made a Thai Tofu Scramble as well, which was based on a Thai Omelette recipe. The ingredients list was pretty minimal, but it was delicious. Had I chosen to bake it rather than cook it on the fry pan, I could’ve gotten something that more resembled an omelette. We had it for dinner with Rice Paper Rolls, Samosa and toasted pita bread. 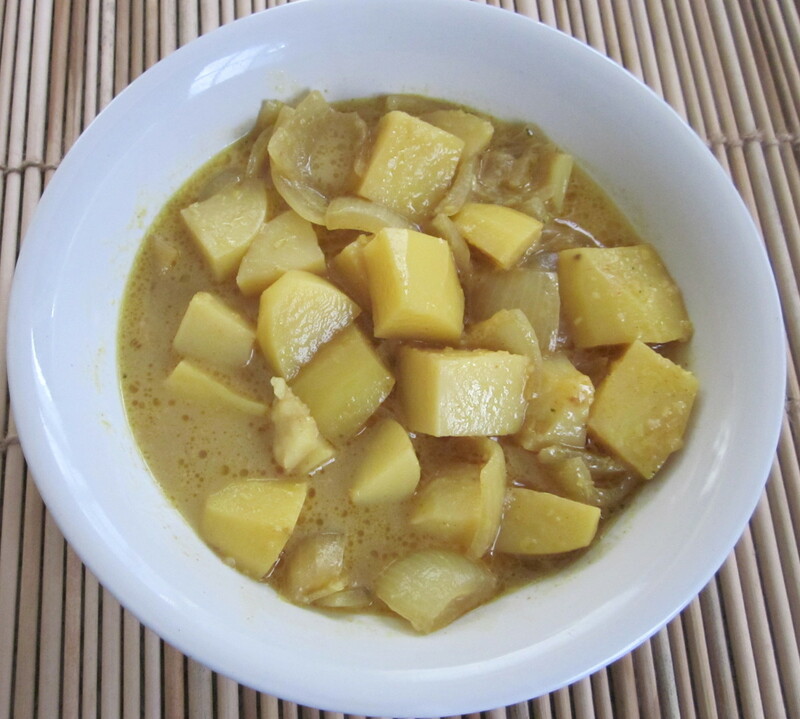 Steve wanted to make another batch of Potato Curry, and I wasn’t going to argue. We still had some of the stir fries from the other night left, plus rice paper rolls, so one dish was all we needed. There were some vermicelli noodles left over from making Rice Paper Rolls, so I threw together a quick Vermicelli Noodle Salad. I just sliced up a few vegies – carrot, mushroom, cucumber and spring onion – tossed with the noodles and a soy sauce based dressing. Feeling a bit drained after an all day meeting, I was more than happy to not make dinner. Steve was feeling keen though so he jumped in and made Massaman and Chickpea Curry. Absolutely no objections from me on that one! Steve had been wanting to make Pineapple Curry for a while, and time was running out. So after getting back from our day at the beach, he got stuck in. Now I’m not generally a fan of sweet main meals, I like my dinner to be savoury, but this was really delicious! The final day has arrived. With the end of Thai January coming up, we’d decided not to replenish any ingredients that wouldn’t be made use of, so by this time it really was a case of just making something up with what we had left. 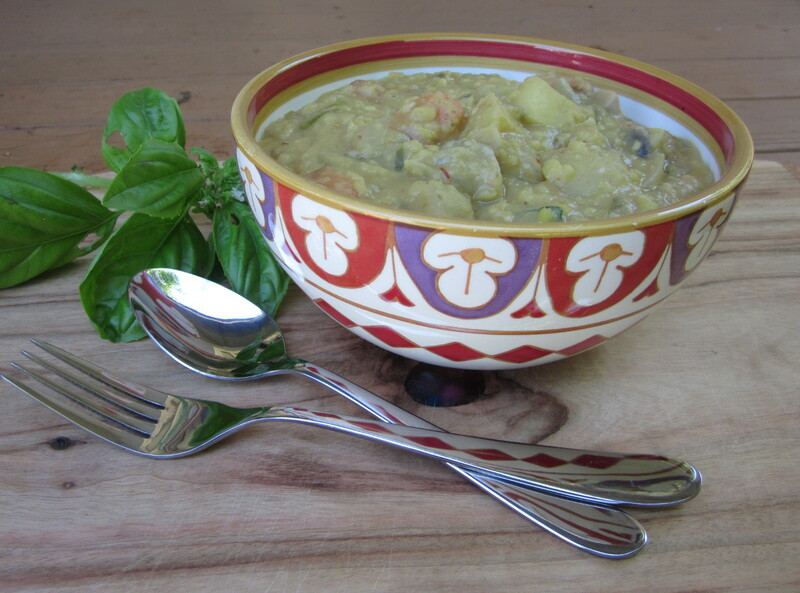 I put my thinking cap on and came up with a Yellow Mung Bean and Vegetable Curry. It turned out to be really yummy! 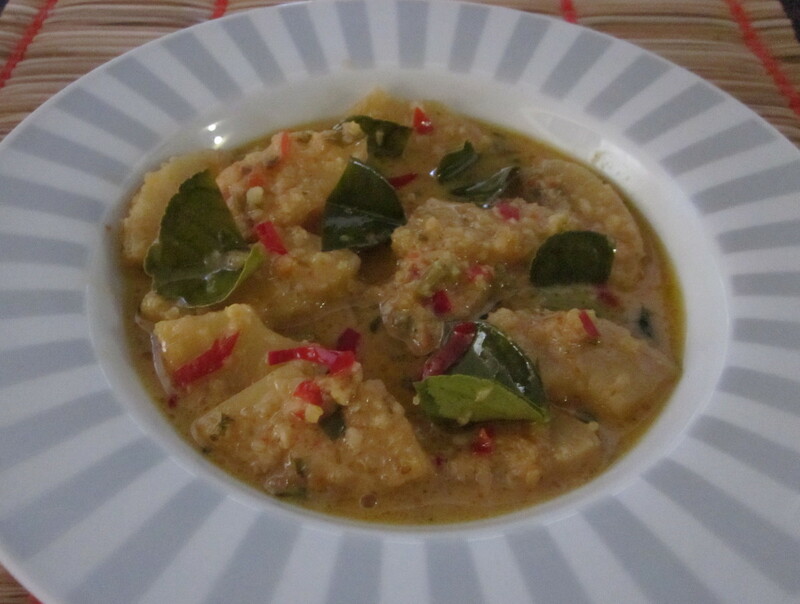 You could probably think of it as being like a Thai Dahl. And so we’ve reached the end of Thai month. Unfortunately I never got back to trying to make Pad Thai again, and there were a few curries I never got around to either. February is looking to be another fun adventure, as we move onto Middle Eastern food. It’s a very broad term that covers a lot of different cuisines, so there might have to be a second Middle Eastern month. We’ll mainly be focusing on Turkish and Lebanese this time, with a dash of some other flavours thrown in. This looks so good!!! Thai food is my favorite! It’s been fabulous eating Thai every day! It’s certainly increased my appreciation of Thai, and we’ve learned a lot.